Crude oil prices today (Wednesday, June 1) tumbled below the $48 mark as the energy market prepares for one of the biggest oil meetings of 2016. Shortly after 9:30 a.m., WTI crude oil prices were down 2.3% to $47.97 a barrel. The U.S. benchmark is coming off a huge winning streak, adding 5.2% in May for its fourth consecutive monthly gain. Futures for July delivery are still up 16.1% in 2016. Brent crude oil prices were also ticking lower this morning. The global benchmark fell 2.2% to trade at $48.77 a barrel. That erases nearly half of last month's 4.5% gain. Futures for August delivery have still surged 16.6% so far this year. The biggest reason why oil prices are falling today is the small chance of a production cap at tomorrow's OPEC meeting. On Thursday, June 2, the cartel's 13 member countries will meet in Vienna for their biannual meeting. Although no specific output proposal is on the cartel's agenda tomorrow, analysts expect the 13 members to refuse any call to freeze output. Tomorrow's meeting marks the first global summit since the failed Doha meeting in April. That was when producers failed to reach an output freeze agreement after Iran's reluctance to cap production forced Saudi Arabia to follow suit. Despite its inconclusiveness, the Doha meeting is hardly considered a failure at this point. After all, WTI crude oil prices have surged 14.1% since then. This sharp rebound gives Saudi Arabia – the de facto leader of OPEC – a chance to brag about the effectiveness of its decision. "[Saudi Arabia] can now argue to fellow OPEC members that its strategy is working and to stick to it," Adel Hamaizia, an oil and gas researcher from the University of Oxford, told The Wall Street Journal. But Saudi Arabia's strategy to keep output above 10 million barrels a day has had dire consequences. According to Moors, several OPEC countries are on the verge of a "Second Arab Spring." That means countries in the Middle East North African (MENA) region are about to erupt into protests thanks to the Saudi plan to hold onto its share of the oil market. You see, there's been a growing divide between OPEC leader Saudi Arabia and the cartel's poorer nations. As one of the world's wealthiest nations with a GDP of over $750 billion, Saudi Arabia can afford to pump more oil for $50 a barrel in an effort to edge out U.S. and Russian competitors. Then, you have countries like Venezuela and Libya that can only sustain their economies when oil costs $100. Venezuela's oil exports make up about 95% of its total export revenue and about 25% of the country's total GDP. Since Venezuela heavily relies on oil exports, its economy contracted by 5% in 2015 and is expected to shrink another 8% this year. In other words, these poor countries are getting poorer thanks to Saudi Arabia's overproduction. This desperation will eventually lead to budget cuts, which will result in social unrest. "Lower revenue from oil sales will be translating into cuts in social programs and a rise in taxes," Moors told readers this week. "MENA nations won't have money for domestic spending because there are simply no oil funds to do it." All of this means Saudi Arabia no longer considers the cartel to be important. This could lead to the dissolution of the entire cartel. The Bottom Line: Crude oil prices today are falling as investors remain cautious ahead of tomorrow's OPEC meeting. Although most analysts don't expect any significant output changes, all eyes should be on Saudi Arabia – the cartel leader known for increasing production for its own gain. The Saudis have almost singlehandedly killed the economies of several other OPEC members. If they continue to keep output at a record high of 10 million barrels a day, it will ultimately lead to revolt in other OPEC countries and send the cartel into a death spiral. 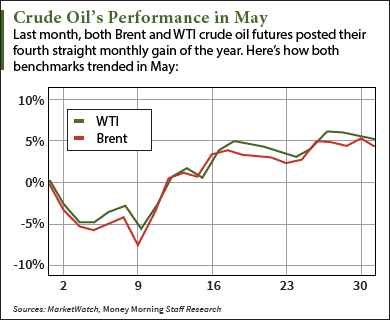 Alex McGuire writes about crude oil prices for Money Morning. Follow him on Twitter for updates on the global energy market.